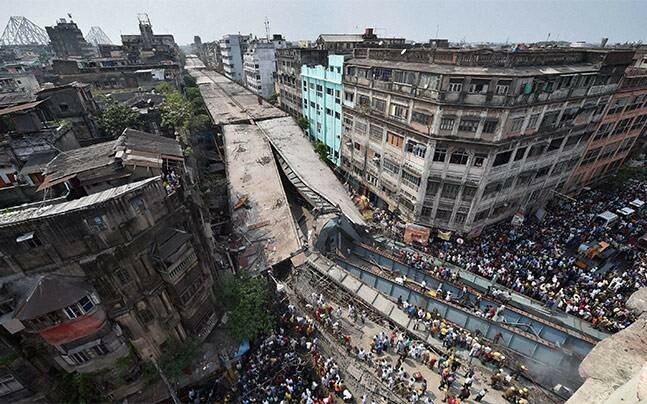 The horrifying incident of Vivekananda Road Flyover which killed at least 25 and injured 78 in North Kolkata’s Girish Park area was destined to be catastrophic. There were many factors that were ignored before the mishap had occurred. The flyover has been under construction since 2009 and has missed 9 deadlines till now. The first deadline was due in August 2010 and after 65 months of the first deadline, only 65% of the of the 2.2 km long flyover was completed. After the construction had started in February 2009, the work was stopped as IVRCL faced bankruptcy. Before commencing the work IVRCL had received 164 crores for the project under JNNURM scheme. The work restarted after a gap of a year and a half when IVRCL managed to arrange funds through debt restructuring. How did Kolkata Metropolitan Development Authority (KMDA) allow a firm which was already facing bankruptcy to bid a project when financial reports of the company are mandatory for any bidding process? keeping West Bengal Assembly Election in mind, the Trinamool Congress government had told the builders to finish the construction work soon. Later on in November 2015, Chief Minister Mamata Banerjee had assured completion of the flyover by February 2016. However, in March 2016, Chief Minister postponed the deadline till August 2016. Secondly, the road between Posta Crossing and Howrah Bridge where the traffic is heavy and blocking the road for the completion of the work would complicate travel for passengers. The locals had also moved to court against the project claiming that the project posed a danger to their buildings and frequent changes in the designs also led to the delay of the project. MDA specified that in order to finish the construction work within August the work needed to continue for at least 10 hours a day differing from the earlier plan of 6 hours a day. For that, the traffic from Posta Junction to Howrah Bridge needs to be bifurcated. Furthermore, Mamata had assured that her government will take serious action and that she had demanded the blue-print of the bridge construction plan from IVRCL authority continuously. But the company had failed to provide her with the blue-print. After facing so many complications to complete the flyover, why didn’t the CM stop the construction work?